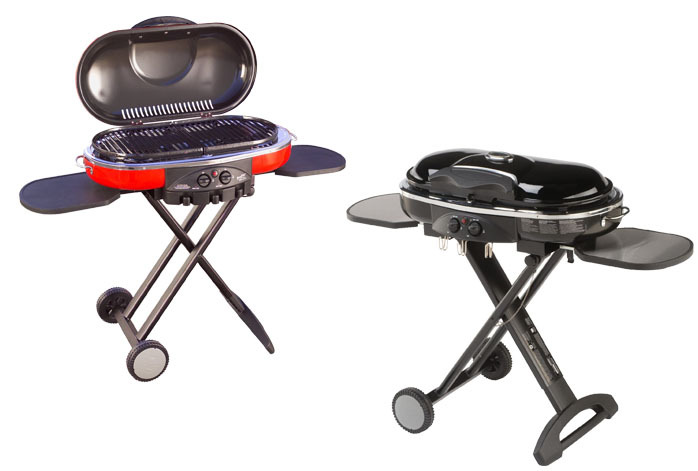 Both Coleman RoadTrip LXE and Coleman RoadTrip LXX are portable and foldable gas grills that work with liquid propane. These products are excellent choices for easy outdoor cooking as well as road trips. However, despite the similar looks, Coleman RoadTrip LXX is a little bit more expensive than Coleman RoadTrip LXE. So, what are actually the differences between the two models? Which is the one that you should choose? Find out below! They are fueled by liquid propane to operate. They are designed to operate with disposable 16.04 oz. LP cylinders, but there is an adapter hose available for purchase if you want to use 20 lb LP tanks instead. Coleman RoadTrip LXE and Coleman RoadTrip LXX are roughly of the same size. They each features two stainless steel burners with a two-piece porcelain-enameled cast-iron cooking grate. Both models also feature the Instastart Electronic Ignition system, which allows you to easily turn on the grill with just a push of a button. Coleman RoadTrip LXE and Coleman RoadTrip LXX each has a collapsible stand. The stand can be folded into a convenient size, allowing you to easily pack it or roll it. They come with detachable side tables, while the feet of the stands also function as towing handles and wheels in the folded form. Coleman RoadTrip LXX comes in a black color, whilst Coleman RoadTrip LXE is available in several color choices: red, maroon, orange, blue, green, purple, silver, and black. Despite the similarities, you need to note that Coleman RoadTrip LXX offers higher heat levels than Coleman RoadTrip LXE. The LXX model is armed with two 11,000 BTU burners, while the LXE model only has two 10,000 BTU burners. Having a higher heating power is, of course, beneficial, as it allows you to cook more quickly and efficiently. Another thing that is worth a note is that Coleman RoadTrip LXX comes with a built-in thermometer. Coleman RoadTrip LXE does not have this feature. With a built-in thermometer, you will be able to know precisely the heat level on the cooking area, which is important for a proper cooking process. - The only grill you need: mix and match grill, griddle & stove grates (accessories sold separately). For just a small price increment, you can get higher heating power and a built-in thermometer. With higher heating power, you can cook faster and more efficiently, while the thermometer is handy in the cooking process. Therefore, you should choose Coleman RoadTrip LXX!